Paul O’Connor reviews a book he meant to read long ago, one that still offers important lessons. Like Paul, I find that I will listen to the audio version of difficult books I cannot make myself read in print. 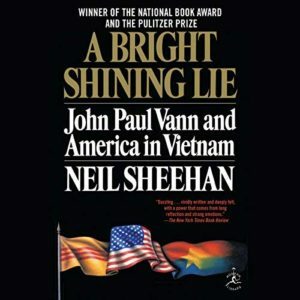 A BRIGHT SHINING LIE: JOHN PAUL VANN AND AMERICA IN VIETNAM. By Neil Sheehan. Random House. 790 pages. Paperback, $21. Audiobook. Random House Audio, narrated by Robertson Dean. 35 hours, 47 minutes. $30.75. A book sat on my shelf for nearly 30 years because I dreaded opening it. I knew I should read it, and I wanted to read it, and I moved it with me to three new houses and assiduously guarded it from the book sales I used to cull my library. But I just could not collect the courage to do so. 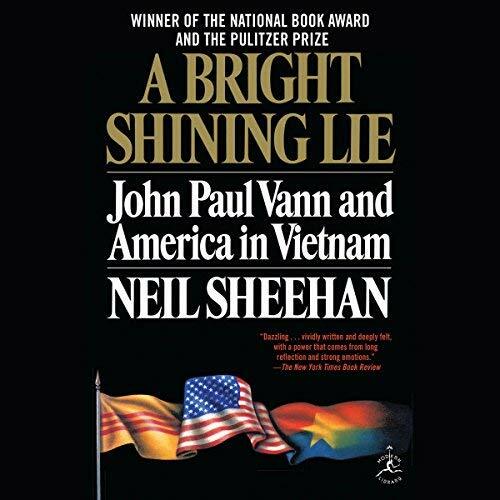 That’s why A Bright Shining Lie sat on my bookshelf, largely unread, from about the time it won the 1989 Pulitzer Prize for author Neil Sheehan until December, when I finally committed to listening to the audiobook version. My dread was justified. It is one of the most depressing, dispiriting and demoralizing books I’ve ever read. At the end, I felt I had completed the most awful kind of penance that Father O’Leary assigned back when I went to confession as a kid. John Paul Vann was a brilliant American soldier, sent to Vietnam as an adviser early in the war, long before it had been Americanized. He arrived with a distinguished pedigree and a war record of exceptional courage established in Korea. And he quickly determined why the war was not being won. One excruciating time after another, Vann urged South Vietnamese commanders to commit to battle or to adjust tactics or to change strategy, always to see them do the opposite. The ARVNs were not there to fight the communist insurgents, he painfully learned, but to serve as the military reserve that would protect the regime of Ngo Dinh Diem from a military coup. And when he tried to explain this to American commanders in country, he was rebuffed and muffled. The result was an insurgency that was not destroyed when the opportunity arose and that grew steadily through the years, years during which he proposed different strategies and tactics and during which he was repeatedly ignored until the time for a particular strategy or tactic had passed. Vann did not struggle in obscurity. He ingratiated himself to the press and was a major source for much of the pessimistic reporting that emanated from Vietnam in the early 1960s, especially David Halberstam’s New York Times’ coverage and his 1965 The Making of a Quagmire. To the press, Vann was one of the rare American military persons who could see the obvious: The war was not being won. Reporters admired him for his courage, honesty and integrity. But this book is not titled Bright Shining Lie only because America’s leaders lied to themselves and to the American people about what was happening in Vietnam. Vann, himself, was a magnificent lie in his personal life, and it is that story that drives a large part of the book. There are no heroes in these pages, just deeply flawed characters who lead the U.S. down a horribly wrong path, one that leads to the deaths of hundreds of thousands of Vietnamese and 58,000 Americans. I dreaded reading it, but once I began listening to Robertson Dean’s narration, I could not abandon it. This is still considered one of the most important explanations of how the American government and military failed in Vietnam, and it is also one hellacious story about the life of one exceptional, but flawed, American officer. This entry was posted in American History, Audio Books, Contemporary Nonfiction, History, Military, Military History, Politics and tagged John Paul Vann, Neil Sheehan, Vietnam. Bookmark the permalink.